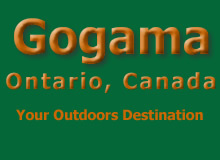 Gogama was home to Wolf Man Joe LaFlamme (1889-1965), one of Northern Ontario's most enduring legends. Internationally known, LaFlamme tamed timber wolves. Well, at least he tried to tame them. Joe himself often said that wolves can never be tamed, their wild instinct lying just below the surface, waiting for a trigger to flare up. And flare up it did, and quite a few times during Joe's 30-year career as a wolf and wild animal trainer. He was lucky to have survived wolf mutinies and a wrestling match with his bull moose. But given his great passion for wild animals, the Wolf Man took the close calls in his stride and always continued doing what he loved best. Originally from St-Télesphore, Quebec , adventurous Joe LaFlamme moved from the hustle and bustle of Montreal to Gogama in 1920. Lillie, his young ex-Parisian wife, accompanied him to the wild frontier of Northern Ontario, which had no road access at the time. There, Joe found work transporting goods and equipment to the various lumber camps--by dogsled. When, in 1923, he lost most of his dogs to distemper, he started trapping and caught by chance a timber wolf in one of his traps. It was then that he decided to trap wolves and raise them to draw a dogsled. Thus began the many adventures which made Joe "Wolf Man" LaFlamme famous throughout Canada and the United States.